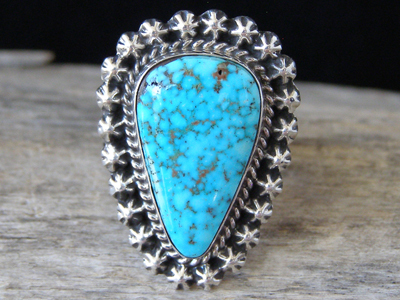 This is set with a pretty teardrop of natural, untreated Kingman turquoise from Arizona. The stone is set in a 3/16" bezel wrapped with twist wire which, in turn, is encircled by starred buttons which form the edge of the ring face. The shank is of uniform width and is marked by stripes of grooved stampwork. Hallmarked H. Piasso and stamped Sterling inside the shank. Ring face: 1 1/4" x 7/8"